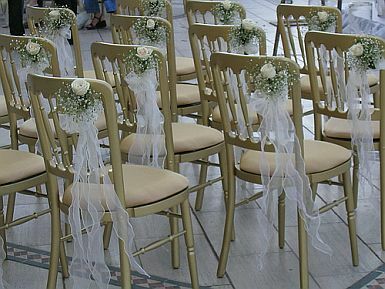 A vital part in the decoration of our marriage are chairs, not enough to worry about the presentation of the tables, the flowers, the centers, the walls, we think that the chairs are an important part of this great day, and there is nothing better be part of the decor. When it comes to wedding chairs, you can choose whether you prefer clothed or unclothed, if the accompany of flowers, bows, ribbons, or anything else, remember that choosing chairs without dress, these should be beautiful and match with wedding decoration, if not, it is best to place them dressed. 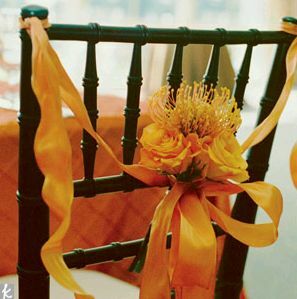 Here are some ideas to decorate your wedding chairs using bows and flowers. Chairs without dress adorned with petite white flowers, a pink chiffon ribbon of the same color, as you can see, these chairs have very good finish. 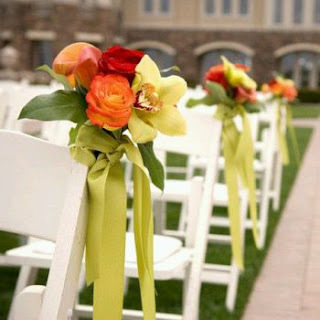 An arrangement for wedding chairs, more colorful, the combination of these flowers to match the green ribbon is perfect for decorating chairs for outdoor ceremonies or to be held during the day. Beautiful and elegant presentation, but the chair is fully dressed, has half of the back covered with gauze at the back of a flower blue hues, covering the knot of marriage. 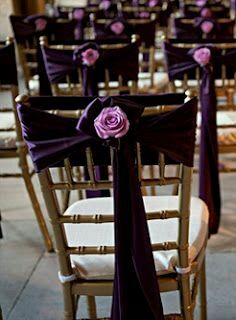 Elegant presentation that was used with the same dark fabric that makes a loop and a rose clearly above. 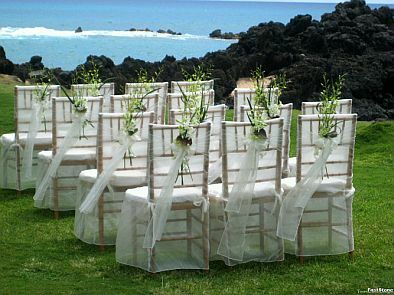 If you love the delicacy and romance, this idea is right for you, as you can see are dressed in white gauze chairs in the back has a bouquet with green and white flowers tied with a bow of the same cloth. 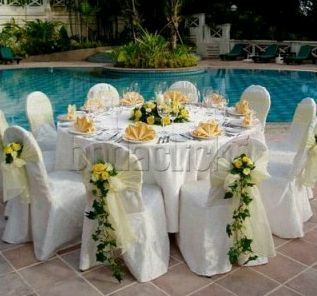 Elegant presentation, are dressed in white chairs and above have the back covered with yellow chiffon in the back a bouquet of white and yellow flowers with a long tail, are the perfect complement. 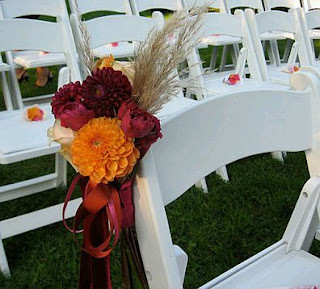 A more colorful and informal bouquet, made with maroon and orange flowers in the back brown branches, give the perfect balance to complete the arrangement, it has a maroon ribbon. 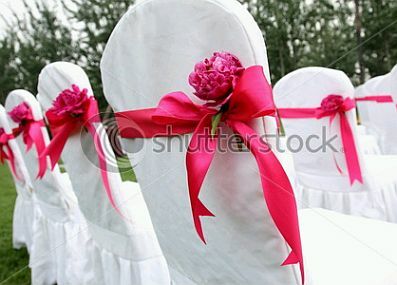 Another idea, chairs dressed in white with a thin pink ribbon in the middle of the back, just as you do a simple loop and above a flower of the same color. 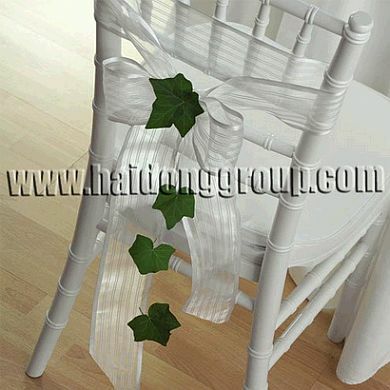 In this case you have a white striped chiffon with it is made in single loop, the twist in the tail of green leaves of subsequent parts. 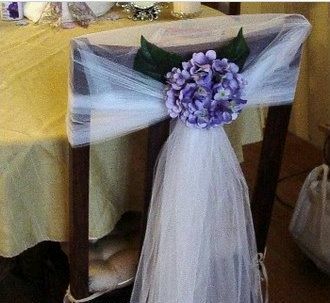 Finally, if you have a flower as beautiful as this, you can hold the middle with a ribbon and make a loop it, the result speaks for itself.